As you know, Open Motif 2.3 (Appendix G - New Features in Motif 2.3) and later support the free type fonts Xft (X free type). To use XFT fonts on Motif, you only have to write some XmRenderTable specific resources into .Xdefaults file as shown below. Please note that the *fontTye is a mandatory item and must take FONT_IS_XFT for Xft fonts. Fortunately, you don't need to change your already-written C/C++ source files for using Xft. 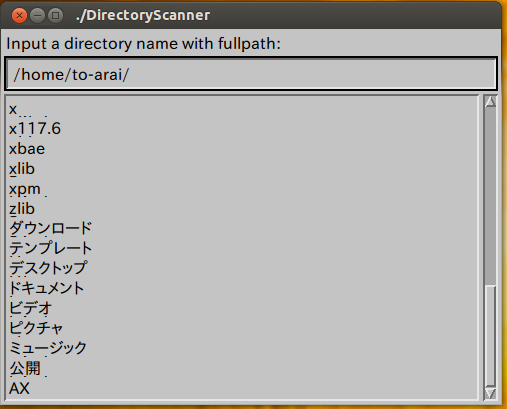 The following DirectoryScanner program is an example to show the directories of your home directory in ListBox. You can see some localized directory names of the directory are displayed properly, but almost all people in Linux world may not be so interested in something like localized strings, then you simply specify familiar Times, Helvetica or Courier for fontName property of XmRenderTable. //Does the directory of string exist?